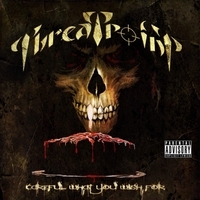 Scranton, Pennsylvania’s Threatpoint have made quite a robust impression on the scene since their spring 2012 inception – Careful What You Wish For being their second full-length album in two years, and spending as much time as possible touring up and down the East Coast bringing their groove metal sound through the underground. After a few spins through the car stereo and laptop, you gather that this group of musicians prefer to synthesize different sub-genres into their particular brand of metal – as you’ll hear nuances of death, thrash, and of course the aforementioned staccato oriented, down tuned riffs or ringing notes that come from the Pantera/Machine Head mold. Drummer CJ Krukowski can fly around the kit like a seasoned professional, and yet understands that if he locks into the pocket for many of the verses such as “Divide & Conquer” and the mid-tempo neck whipping “Stronger than Death” the immediate impact takes the retention factor to the max. A lot of the riffing fluctuates between heads down meaty power chords punctuated with high melody harmonies or squeals at the end of phrasing or moving into transitions – something akin to Machine Head meets Killswitch Engage if thrown into a little bit of a Grip Inc. blender. As a vocalist Chris James seems to possess a multiple personality platform: equal parts roaring and screaming, often drawing out words or phrases for added intensity and chilling inflection. 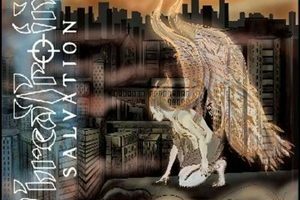 Check out the work on the slower churning “Vultures of Prey” (‘praying on the sadness/circling the carcass/ready for the kill’) or the low tuned evil “Hatebox” and you may sense a lot of Chuck Billy, Dez Fafara, and Robb Flynn in the attitude and fierceness that pours through your speakers. The acoustic guitar/piano touches on the semi-djent 5:40 closer “When Karma Comes” gives Threatpoint that dynamic twist that most groove metal bands wouldn’t dare follow – and guitarist Alex Olivetti also is a secret weapon to the good for his melodic lead breaks bring “Devil You Know” and “Mockingbird” up a few notches in musicality. Minor criticism comes into focus in occasional nursery rhyme oriented melodies (‘fool me once, shame on me/ fool me twice, you’ll clearly see’ in the aforementioned “Mockingbird”) and the 14 song/58 minute package can be a tough front to back listen if you aren’t on a long travel excursion. 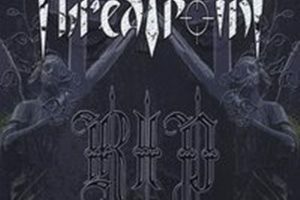 In the end, Threatpoint could make you second guess your opinion of groove metal. Careful What You Wish For should win over a healthy cross section of metal heads – as great production and killer hooks level the competition most of the time.